you know i heart Laura Mercier and their Colour To Go Palette is one of my favorites for the holidays. it is a compact that houses every eyeshadow color, eyeliner, blush, bronzer and lip gloss for a complete look. the perfect item for packing when you are heading out to party the night away during the holidays. i am a palette lover but i often find them incomplete - typically lacking an essential shade or color. 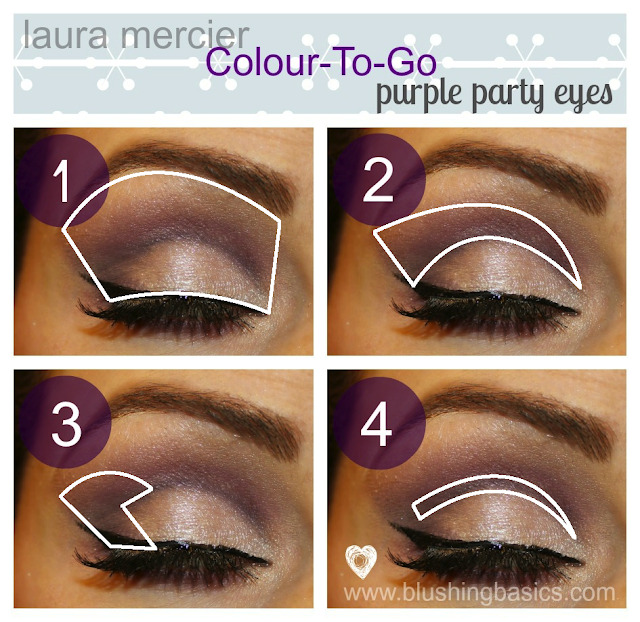 this Colour To Go palette was used to create one of my favorite holiday looks so far, the purple holiday eye. created in my latest favorite fashion (the style i dubbed 'the hollywood eye') by dramatically extending the color past the outer corner of the eye and connect with the end of the eyebrow. i may be tiptoeing a fine line between drag queen and beautiful makeup but i am in love. apply highlighter color over entire eyelid. blend neutral midtone shade into crease. apply deeper midtone to outer corner of eye. using Tightline Cake Eyeliner (darkest shade) draw a line in your crease. I Love it. Drag Queens know something we don't apparently... because the blending is amazing!!! ps. I don't think you look like a drag queen AT ALL.